[Kp,Ti,Td,N] = pidstddata(sys) returns the proportional gain Kp, integral time Ti, derivative time Td, and filter divisor N of the standard-form controller represented by the dynamic system sys. [Kp,Ti,Td,N,Ts] = pidstddata(sys) also returns the sample time Ts. [Kp,Ti,Td,N,Ts] = pidstddata(sys, J1,...,JN) extracts the data for a subset of entries in the array of sys dynamic systems. The indices J specify the array entries to extract. SISO dynamic system or array of SISO dynamic systems. If sys is not a pidstd object, it must represent a valid PID controller that can be written in standard PID form. Integer indices of N entries in the array sys of dynamic systems. Proportional gain of the standard-form PID controller represented by dynamic system sys. If sys is a pidstd controller object, the output Kp is equal to the Kp value of sys. If sys is not a pidstd object, Kp is the proportional gain of a standard-form PID controller equivalent to sys. If sys is an array of dynamic systems, Kp is an array of the same dimensions as sys. Integral time constant of the standard-form PID controller represented by dynamic system sys. If sys is a pidstd controller object, the output Ti is equal to the Ti value of sys. If sys is not a pidstd object, Ti is the integral time constant of a standard-form PID controller equivalent to sys. If sys is an array of dynamic systems, Ti is an array of the same dimensions as sys. Derivative time constant of the standard-form PID controller represented by dynamic system sys. If sys is a pidstd controller object, the output Td is equal to the Td value of sys. If sys is not a pidstd object, Td is the derivative time constant of a standard-form PID controller equivalent to sys. If sys is an array of dynamic systems, Td is an array of the same dimensions as sys. Filter divisor of the standard-form PID controller represented by dynamic system sys. If sys is a pidstd controller object, the output N is equal to the N value of sys. If sys is not a pidstd object, N is the filter time constant of a standard-form PID controller equivalent to sys. If sys is an array of dynamic systems, N is an array of the same dimensions as sys. Sample time of the dynamic system sys. Ts is always a scalar value. Extract the proportional, integral, and derivative gains and the filter time constant from a standard-form pidstd controller. Extract the standard-form proportional and integral gains from an equivalent parallel-form PI controller. Extract parameters from a dynamic system that represents a PID controller. represents a discrete-time PID controller with a derivative filter. Use pidstddata to extract the standard-form PID parameters. the pidstddata function uses the default ForwardEuler discrete integrator formula for Iformula and Dformula to compute the parameter values. Extract the gains from an array of PI controllers. The parameters Kp, Ti, Td, and N are also 2-by-3 arrays. Use the index input J to extract the parameters of a subset of sys. If sys is not a pidstd controller object, pidstddata returns Kp, Ti, Td and N values of a standard-form controller equivalent to sys. 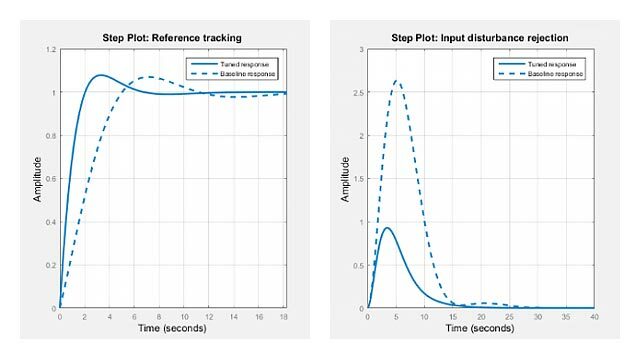 For discrete-time sys, piddata returns parameters of an equivalent pidstd controller. This controller has discrete integrator formulas Iformula and Dformula set to ForwardEuler. See the pidstd reference page for more information about discrete integrator formulas.